Family Search is one of my favorite genealogical websites. They have many great features, but one of my favorites is their “Watch” function. It is simple but really powerful. 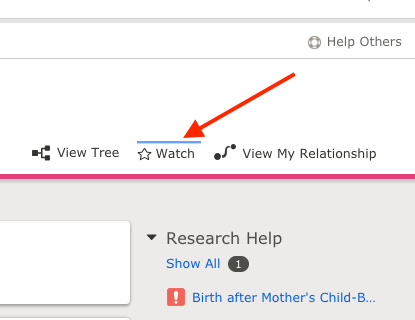 Family Search uses a universal tree. That is to say, everyone with a FamilySearch account sees the same tree (except for living individuals you created). Some people don’t like that feature because it means you do not have complete control over your tree. But once you have a person in the tree, you can watch that individual and be informed of any changes that occur with that person. Those changes can provide import clues for your own research and can suggest contacts clearly interested in the same individuals as you are. 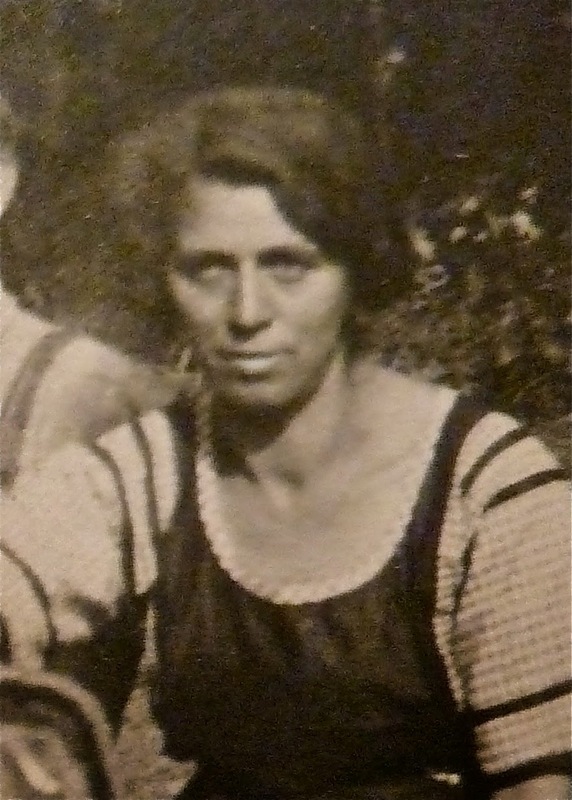 One of my problem research areas has been my wife’s great-grandmother Bertha Barbara (Trümpi) Huber and her parents [Bernhard and Bertha (Koch) Trümpi]. Little more than their names were in the tree when I began watching each of them. Over the past few months, another researcher has added several children to the couple that I didn’t know about, a second wife, who I knew about but didn’t have a name for, and Bernhard’s parents’ names. Wow! New Brother: Bernhard (1891-1961) Potential. New Sister: Emma (1901-1901) Potential. The entries also confirmed information I have about Bertha, Frieda, August, and Ernst. Bernhard Trümpi married Regula Staüsi in 1867. They had seven children, four of whom died as infants. Regula died in 1882 and Bernhard married Bertha Koch in 1883. Although Regula was only two years younger than Bernhard, Bertha was 19 years younger. Now the family oral history which said that Bertha Barbara came from a large family makes sense. I had her with six siblings, with the addition of new family members she may have had 15 siblings, 11 of which live to adulthood. That would be a large family. Finally, the researcher suggested that Bernhard’s father was Bernard and his mother was Anna Maria Oertli. That knowledge opens an entirely new avenue of research. That which I thought was a brick wall now has many new holes for me to pick at and find a way through. Thanks to the “Watch” feature of Family Search I circle around and have a new direction for my research. If you aren’t using the Family Search “Watch” feature, I highly recommend you do so. I recently had the opportunity to be a Genealogy “brick wall buster,” which is a person who helps someone break through their genealogical brick walls. They say teaching a subject helps the teacher learn the topic even more. Likewise, helping others with their “brick walls” is an amazing process wherein I learn so much more. Anyway, one of my querists wanted to know, How to find marriage records in Maine. As I thought about how I would approach the question I thought of several Wikis and ask the person if they used the Family Search wiki. She said, “No.” As I went through the day, I realized how few people knew about the two best genealogy wiki sites on the Internet. Everyone I spoke to during the day used Family Search and Ancestry.Com, but none of them ever used either of the two wikis. I prefer the Family Search wiki. http://familysearch.org/wiki. It seems to always provide the answer to my research questions. For example, a search for Maine Marriage Records brings me to a page about the differences in records before 1892, between 1892 and 1922, and since 1922. The Ancestry Wiki: http://ancestry.com/wiki/ is also a hidden gem – a fountain of information. Many people have subscriptions to Ancestry and many others access Ancestry through their local libraries, but I found few use the Ancestry Wiki. The results received from searching the Ancestry Wiki for “Maine Marriage Records,” was not quite as clear as Family Search but did quickly lead me to a Maine Vital Records page, which also told me all I needed to know. http://network.mainegenealogy.net/profiles/blogs/maine-county-marriage-returns, which explains methods to access some of the early Maine marriage records that may exist. For Scarborough Records, the Cumberland County Marriages from 1786 thru 1886 may be browsed on the Family Search site at https://familysearch.org/search/catalog/553508. Look for the camera icon at the bottom right to see the images. 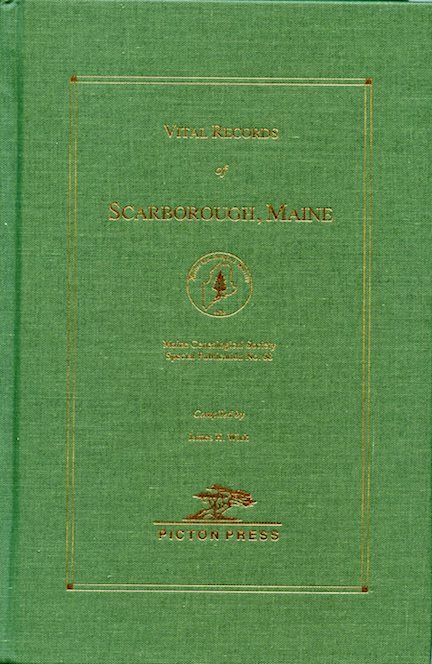 There is a great book, Vital Records of Scarborough, Maine by James H. Wick published by the Maine Genealogical Society (MGS). The book is currently out of print and unavailable from the MGS, however, Minerva indicates it is available at several libraries in the area, (See https://tinyurl.com/ycb5ga9x) including the Scarborough Public Library. We also have a copy of it at the Scarborough Museum which may be viewed at the museum. Also at the museum, we have several boxes of microfilm. As an example, one of the boxes, Number 225, is a reel of “Town Records Births prior to 1891 with some dates to 1908, deaths ca. 1819-1891, intentions of marriage and marriage records 1816-1879. I need to find a way to get these digitized and available or, better yet, find where someone else has already digitized these records. Do you know of additional Maine Marriage Record sources available? If so, please let me know through the comment form below. A friend was telling me that his wife knew her ancestors, the D’Amico side, were Italian, but didn’t know where in Italy they were from. He also told me he didn’t have any idea where to start. He said they had poked around Ellis Island records but found nothing. He provided me very little information, just the parents names, grandmother’s name. He mentioned they settled in New England (Mass. & Maine) and one key bit of information, her father died in 1959 at the age of 43. As a former Project Manager, I really believe in the process. My process is to always enter what I think I know into a family tree program. I currently use Heredis 2015 World (Mac) [By the way, Heredis is running a 50% off sale which ends today.] as my preferred genealogy organization software, but I could as easily other software or even paper. The process is the same either way. 1. Enter what you think you know. a. Enter the known relationships and any known vital facts. In this case, there wasn’t much to begin with, but entered it and started. Starting point for D’Amico Project. 2. My next goal is to find the family unit in at least two censuses and make sure that I have a family unit understood. I typically use Family Search for my initial start. I like Family Search particularly because I like their “copy” feature. It provides an easy way to copy all of the data of the record plus the source citation in a single click so I can easily paste it into a source record in my software. I also like to confirm any of the seed facts from step 1.
a. I then created a source entry and pasted the information into it. I saved that and then created the facts I wish, and drag and drop my source to the fact I’ve entered. In this case the month and place of death as well as the birthdate. I was fairly certain that this 1930 Census record was the correct family but wanted to be absolutely certain. I contacted my friend to have him ask his wife if her father grew up in Franklin, MA, and did she have an aunt Elinora and uncles, Frank, Joseph, and Victor. She responded that she did, so I knew I was with the right family. 3. My next process is to follow the individual through all the censuses of his or her life. I found him in the 1920 Census with his father, Michael (new name) his mother, and his four siblings. The census reported that the father, Michael, was born in Italy, immigrated in 1890, and was naturalized in 1900. [iv] That finished all of the census records for the Michael the son. Now on to follow Michael the father through more census records; he should be listed in 1910 and 1900. * Note: Before the 19th Amendment women took the citizenship of their husbands upon marriage. I wasn’t successful in quickly finding Michael D’Amico nor Marguerita Melano in the 1900 Census but I decided to continue on anyway and see if I could answer the questions. Switching to Ancestry.com I searched Immigration & Travel for Margherita Melano arriving in 1904. Searched Immigration & Travel for Margherita Melano. Using the information, I had regarding Michael, I didn’t find anything in Immigration & Travel that seemed to fit him. Then I searched the Birth, Marriage & Death records for Michael D’Amico born in Italy 1864. Up came an index record for Michele D’Amico, Baptized 1 May 1864 in Civile, Casalvecchio Di Puglia, Foggia, Italy. Father Donato D’ Amico and Mother Eleonora Rossacci. [viii] That must be him. Michael’s first son was named Donato and his first daughter was named Elenora clearly after his parents. The age was right. Casalvecchio Di Puglia is about 100 miles northeast of Naples. I know that it is a leap to ascribe the Baptism record of Michele D’Amico of Casalvecchio Di Puglia to Michael D’Amico, the grandfather of my subject individual, but because of the expected birth date and the parents’ names (as they relate to the grandfather’s children’s names) I believe it is a good fit. So tentatively, I have him with that baptism and birth location. According to The Statue of Liberty – Ellis Island Foundation, Inc. website, there was a Michele D’Amico who arrived in 1899 aboard the SS EMS whose last address was Cercemaggiore, which is about 35 miles from Casalvecchio Di Puglia. That is his likely immigration, however, I can’t prove it and it will take a bunch more research to prove it. 1. Start a tree. Fill in what you think you know. 2. Confirm what you think you know with evidence. 3. Find the individual in every census. 4. Find the individual’s vital (birth, marriage, death) information. 5. Seek answers to specific questions in appropriate locations. Move on to another ancestor. In this case, I believe that Michael D’Amico was born in Casalvecchio De Puglia and possibly lived in Cercemaggiore. I also believe that Marguerita Melano was from Caserta. Both were from southern Italy within 100 miles of Naples. [i] 1940 Census; Michael A D’Amico – Ward 9, Portland, Portland City, Cumberland, Maine, United States; Family Search. [vi] 1910 Census; Michael D’Amico – Franklin, Norfolk, Massachusetts; Sheet 26A, Household 525; Family Search. [vii] New York, Passenger Lists, 1820-1957; Margherita Melano – 1904 Arrival, New York, New York; Ancestry.com . [viii] Italy, Select Births and Baptisms, 1806-1900; Michele D’Amico – Baptism Index; Ancestry.com . I don’t like to admit it, but oftentimes I accept the index entries for records. I know I should view the source document for everything possible, but the time, effort and cost of seeing every document often seems prohibitive. When the index provides the key information I need to know, I generally accept it. Although I know that the original documents may show much more information or even provide more accurate information, I have been lax and not ordered the actual film. Such is the case of the marriage of Samuel Scott and Amanda Haley. Then I saw a second record, Samuel V. Scott married Amanda J. Haley on 24 May 1879. He was 18 and she was 19 years old. [ii] I thought to myself, ‘that’s odd, well they probably either lied about their ages or they had birthdays between when they got their license and the actual day of the marriage.’ Then I noticed that they were two different indexes from the same database. That seemed really odd. Hmmm, a day here, a year there, before long I found myself with questions about what was accurate. Samuel and Amanda are second great-grandparents on my Roberts tree, so it is important to me to assure their information right. The only way to know for certain is to order the films and see exactly what these indexes were based upon. I figured that I might need to order the record from the county court, but, I decided to go back to Family Search first. I thought with this many family members it is a microfilm well worth ordering. I added the image numbers, so that when I received the microfilm I’d have the image numbers so that I could quickly and efficiently find the records I am interested in. Then, I went to the records page[iii], so that I could order the microfilm. I saw the collection included three microfilm reels and an index (the one I was using) was available online. Looking further down, I realized that there was an icon to “browse the images online.” I didn’t need to order the microfilm. [iv] The on-line index just wasn’t linked to the images, but the film has been digitized and is available online. My list of image numbers of interest was perfect. I quickly downloaded the images and all the information on many family members. Wow, so much information, so quickly. Bride: Amanda J Healey | Residence: Goode Tp, Franklin Co.
Where and When Married: Goode Tp. Franklin Co. May 24 1879 | Witnesses: G. Elknis & R. Elknis [??] | By whom Certified, Name and Office: S. M. Brayfield, J. P.
The marriage license number and when it was applied for. Where Samuel and Amanda lived at the time. Conflicting information regarding Samuel’s place of Birth (I had/have Illinois, I’ll need to sort that out later). Who the witnesses were (although it is difficult for me to read). And, most importantly, I learned the answer to my question about Samuel and Amanda’s ages. Samuel was 17 and Amanda was 18 when the license was taken out and at their NEXT birthdays, they would be 18 and 19. Everything fit (except Sam’s birthplace) once I saw the actual register. This case acted a reminder, when using Family Search, always check for the film of a document. You can get a lot more information from the image without much more effort. Sometimes very important information. They might have the film digitized and available on-line. Even if they don’t, if you can afford it[vi], order a copy, you never know what more you can learn. I know better than to take the easy way, and I plan to do better in the future. Prove where Samuel Scott was born (Illinois or Tennessee). Incorporate the marriage information for the other Scott and Haley family members in my tree that were married in Franklin County. [i] “Illinois, County Marriages, 1810-1934,” database, Family Search (https://familysearch.org/ark:/61903/1:1:KFK4-RF1 : accessed 14 March 2016), Samuel V. Scott and Amanda J. Haley, 24 May 1879; citing Franklin, Illinois, United States, county offices, Illinois; FHL microfilm 1,005,309. [ii] “Illinois, County Marriages, 1810-1934,” database, Family Search (https://familysearch.org/ark:/61903/1:1:KFKW-85D : accessed 14 March 2016), Samuel V. Scott and Amanda J. Haley, 24 May 1879; citing Franklin, Illinois, United States, county offices, Illinois; FHL microfilm 1,005,307. [vi] $7.50/film roll to rent and view at your local Family History Center. I like to control and manage my family tree information. As such, I’ve never been a fan of systems where family trees are managed by many individuals. I tend to be concerned that other individuals aren’t quite as thorough as I like to think that I am. I also like to work from sources and not rely on other individual’s family trees for anything other than “hints,” so I don’t really use other people’s family trees much. I was researching Hugh Ellis Roberts and couldn’t find much information. I was having such a bad time that I decided to use Family Search Family Trees to see if I could gain any leads there. After selecting [Family Tree} [Find], entering my subject’s name and year of birth the system returned 50 different entries. Four of the first five entries were my particular Hugh Ellis Roberts. They all had the same birth year, all had the same death year and they all had the same spouse. None of the entries had any sources for their information at all. Sigh…. I decided I couldn’t let four entries for the same individual stand so I selected the one that had the most information, parents and children names, and began merging the other entries into that one. It wasn’t as difficult as I thought it would be. I also corrected the marriage date from “Oct 1900” to “7 Oct 1900” and associated my source to that fact. There is still a problem with his being married to three different people, Clara, Clora, and Cora Dell Scott. I’ll merge those identities up when I work on Clara’s biography and decide on what I really think her name was. (Different records all are interpreted differently.) There are still other issues with the family unit on Family Search Family Trees, such as one of his sisters being duplicated, but I’ll fix it as I work on the family unit. I saw that Talaramer was a transcriber’s attempt to read a nearly illegible Florence. The birth year and place for Anna matched Patience Anna, the birth date matched the month, year, and place for Florence, and the birth month, year, and place all matched Hugh. Last, but not least, it was in Franklin County (which borders Jefferson County), Finally, I had found Hugh Ellis Roberts in the 1900 Census. Hint: When looking for someone in a census, try ignoring the first names of individuals and just search for a surname with other identifying criteria. Hugh Ellis Roberts[i] was born in July 1884 in Illinois. His marriage license indicated that he was 18 when he was married in 1900; however, I think it is more likely that the 16-year-old Hugh lied about his age in order to marry without parental permissions. One on-line source indicates that he was born in Jefferson County, Illinois, however, the marriage license of his son, Bert Allen Roberts indicate that he was born in Benton (Franklin County, Illinois. [ii] According to other researchers, Hugh died on 30 August 1908.,[iii] Several of his children’s marriage licenses identify their father was deceased when they married in the 1920s, thus confirming the early death. Additionally, Hugh’s wife remarried in 1909. He is the fourth known child of Asa Ellis Roberts (1835-1887), aged 49, and Patience Anna Marshall (1845-1919), aged 39. Asa and Patience had three other known children together, Charles Wilson, Rosa Della, and Florence Elizabeth Roberts. Asa was married previously to Cynthia Minerva Toney and that had six children so Hugh was the youngest of ten children of Asa. His six half-siblings were William, George, Margaret, Calvin, Sarah, and Monroe. When Hugh was only three, his father, Asa Ellis Roberts, died (8 October 1887 – Spring Garden, Jefferson County, Illinois). Harry Ray Roberts, born on 22 May 1900 in Franklin Co. (Franklin Co., Illinois). He married Lillie Vernea Higgins in 1922. Bert Allen Roberts, born on 20 September 1903 in Sesser (Franklin, Illinois), died on 1st May 1949 in Elwood (Madison County, Indiana), aged 45. He married Essie Pansy Barnes on 13 May 1922. They had 5 children: Pansy, Bert, Hugh, Helen and John. Mabel Ilean Roberts, born on 2 June 1908 in Lena (Stephenson County, Illinois, United States), USA. She married Olan B Hart on 3 January 1925. It appears that the Roberts family moved from Franklin County to Stephenson County between 1903 and 1908. Find Property Record for Anna’s farm ownership. [iv] Source: 1900 Census; Anna Roberts, Barren Township, Franklin, Illinois, United States; citing sheet 10A, family 182. [vii] Note: They say the first child can come anytime, the rest take nine months.